The term science originates from the Latin scientia, or knowledge. In a general sense, science is concerned with the discovery and organization of knowledge. Scientific knowledge is created by employing scientific methods that are founded on the twin principles of observable events and empirically testable theories. It is common to subdivide science into naturalincluding biological, environmental, and physicaland social sciences. Geography is concerned with the patterns and processes that describe and explain the form and function of the surface of the earth. It is somewhat unique in that it falls at the boundary and overlaps a number of the classes of science (it especially covers both environmental and social science). Indeed, a central axiom of geography is that it is concerned with human-environmental interactions and specializes in the synthesis of multiple concepts, theories, methods, processes, and information types. In this sense, geography is the science of understanding our world. A study of foreclosures in Colorado using exploratory spatial data analysis and geographically weighted regression (a new feature of ArcGIS 9.3 Desktop). All sciences have their portfolio of commonly used tools: astronomers use telescopes to view stars and information systems to record their characteristics, biologists use electron microscopes to visualize the structure of cell organelles and supercomputers to simulate ecological systems, and computer scientists develop new computer architectures using computer-aided design software. Geographic information scientists also have their toolsgeographic information systems (GIS)which are a fundamental and integral part of pursuing geographic information science. GIS is the technology for capturing, managing, manipulating, and visualizing geographic information. GIS is essential to modern geographic information science, for without GIS, it would not be possible to collect large volumes of information about observable events and build and test theories about geographic patterns and processes. Without information system technologies, many interesting geoscientific problems are intractable. Geographic information science is concerned with the fundamental principles that underlie GIS: that is to say, the basic models, methods, and generally held tenets of geography and geographic information. A basic understanding of geographic information science is essential for all geographic information work. It is a necessary foundation for all GIS data management, analysis, and visualization activities. Some examples will help illustrate the importance of the scientific perspective to GIS. Consider, for example, how science impinges on GIS from an information-flow perspective. Whenever information is entered into a GIS, a number of choices need to be made about how the continuous complexity of the real world can be represented in the finite complexity of a digital computer system. 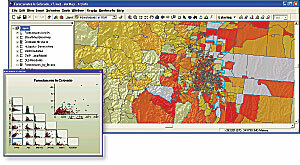 Sampling strategies are used to decide what to put in and leave out of a GIS database. Representational frameworks require decisions about the precision and method of encoding, which can have profound implications for later operations. One of the biggest mistakes that GIS users make is using information that has a resolution that is too coarse (insufficient precision) to support the analytical methods being used and the conclusions being drawn. Whenever geographic information is transformed from one state to another (for example, reprojection, raster-to-vector conversion, and polygon overlay), information is lost. 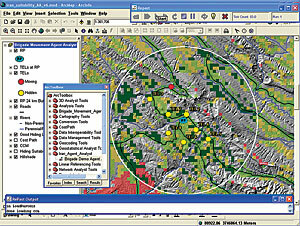 The mapping and visualization activities of GIS also have the effect of generalizing information (for example, choro-pleth maps classify polygons into a small number of classes, 3D displays omit less important points to speed up display, and charts often use a small number of symbols to make it easy to see trends or patterns in data). The true "fitness for purpose" of geographic information can only be properly determined if the history of the information is known or if appropriate measures of accuracy and precision are recorded. Geographic information scientists refer to such issues as the "uncertainty" of geographic information, and a number of spatial statistical techniques have been developed to incorporate uncertainty into analytical operations. GIS typically deals with very large amounts of information. Over the years, many scientific methods have been developed to summarize geographic information so that it can be better understood and communicated to others. The objective principles of cartographic representation and communication are a complete subdiscipline that for many years have drawn on the principles of geographic information science. In the last few years, there has been an upsurge in interest in new ways to visualize geographic information using new and novel scientific geovisualization methods. 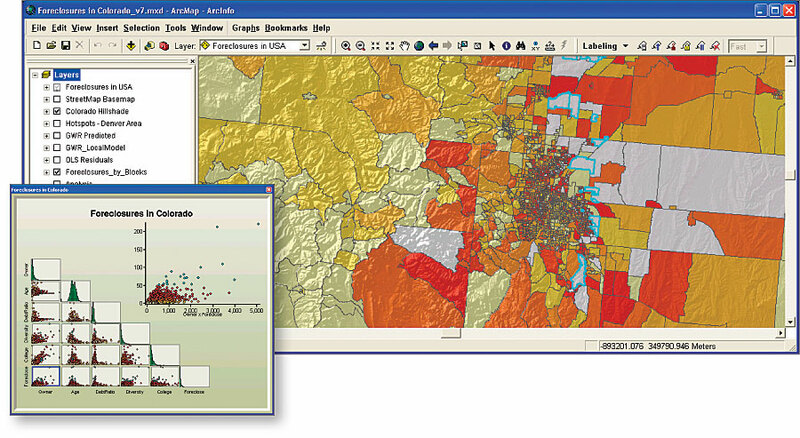 These include exploratory spatial data analysis (ESDA) tools, on-the-fly calculation and display of local statistics, visualization of the uncertainty of information, and mapping of multivariate data using complex symbology. Collectively, these techniques allow scientists to gain a better understanding of the structure and content of geographic information and to ensure proper model specification and validation. Agent-based modeling of missile siting in Iraq. Geographic information science is nowhere more obvious than in the broad area of spatial analysis and modeling. Generally speaking, the field can be split into inductive and deductive approaches (sometimes called descriptive and inferential statistics). Inductive analytical scientific methods are used to reveal geographic structures and trends within information sets. For example, distribution maps of crime are used to inform decisions about the deployment of policing resources, spatial clustering algorithms form the basis of attempts to search for higher-than-expected incidences of cancer cases, and cokriging is used to predict the location of a precious metal based on its association with a second mineral whose distribution is more widely known. Deductive analytical scientific methods are generally thought of as more powerful than inductive methods because they are used to test hypotheses, which eventually allow scientists to create general models and laws about the world. For example, geographically weighted regression models have been used to test hypotheses about the relationship between house prices and various socioeconomic indicators, and spatial clustering algorithms used in conjunction with significance tests can determine if the distribution of plant species is random. In recent years, geographic modeling has also become increasingly widespread. 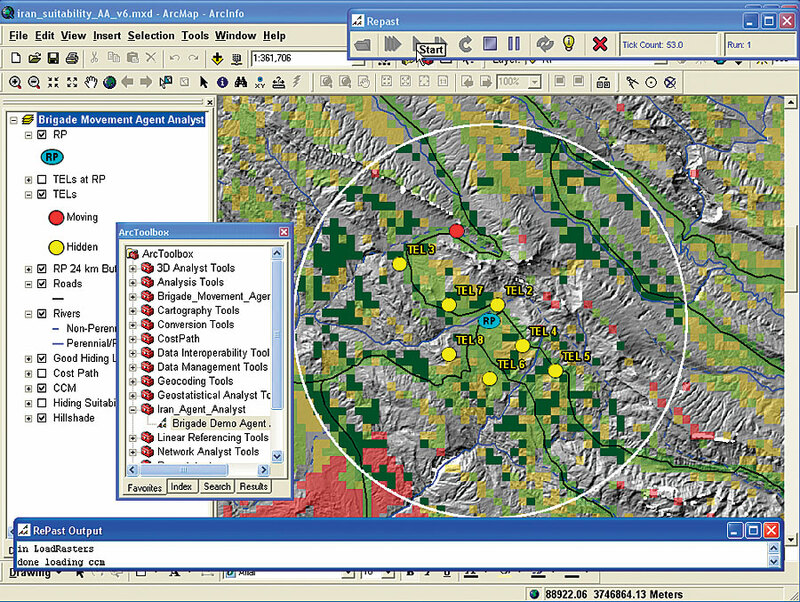 Advances in computer processing have enabled advanced geocomputational processing of large information sets. Many types of models have been created, including process models that help explain how existing geographic systems function and simulation models that predict future states. Science is not static but is in a constant state of evolution. Theories are constantly being challenged, new ideas and models are being advanced, and there is much healthy debate. In the past few years, scientists across many disciplines have started to use a new approach to advancing knowledge and understanding. In part, this new science originated from the contribution of new information technologies, but it is also a result of the way scientific communities are being organized and funded. In this new organizational paradigm, the time-scales for developing and reporting scientific progress are decreasing from decades to years and, with Web publishing on the rise, to months and weeks. Ideas about the central importance of so-called "blue-skies" research, which is driven by curiosity, are being challenged, and there is a call for more applied science that is relevant to society and able to generate economic value. Especially in the field of GIS, industrial research and development are outpacing academic and government research in many areas. In the private sector, there are larger teams, and funding is greater for both short- and long-term research. At the same time, the model of lone scientists or small, narrowly focused research teams is being replaced by larger, interdisciplinary teams that operate across the traditional academic boundaries. This all comes quite naturally to geographers who have basic training in problems that span the environmental and social science fields (e.g., the impact of climate change, sustainable development, and the conservation of natural resources). Geographers are increasingly dependent on the science and technology of GIS to describe the form of geographic entities and the relationships between them. At the same time, they are undertaking analyses and building models that help us understand the complex processes that operate over space and time. In the past, it was possible to separate science from technology, but it is now becoming increasingly clear that there is a symbiotic relationship between them and that one cannot exist isolated from the other. Dr. David Maguire is chief scientist of Esri. He is coeditor of GIS, Spatial Analysis, and Modeling (Esri Press, 2005) and Geographical Information Systems: Principles, Techniques, Management and Applications, 2nd edition (Wiley & Sons, 2005). For more information, contact David Maguire, Esri (e-mail: dmaguire@esri.com).